The Ultimate Baking Starter Set is an all-inclusive kit containing kid-friendly real-working kitchen tools that take the legwork and mess out ofcooking with kids. Make picture perfect desserts with specialty utensils. Keepit neat with Mixing Bowls that suction in place. Kids will love the One-TouchEgg Cracker that is fun to use and keeps mixes shell-free. 3 differentSilicone trays cool fast and clean faster. Make the perfect dough thicknessevery time with the customized Rolling Pin and Dough Guide. Amaze your friendsand family by swirling two flavors of frosting on your cupcakes, creatingRainbow Glass Cookies, and making the cutest frosted mini donuts you've everseen. Real Cooking by Skyrocket Toys is a line of baking kits that empowerkids to make beautiful & delicious treats using real ingredients. 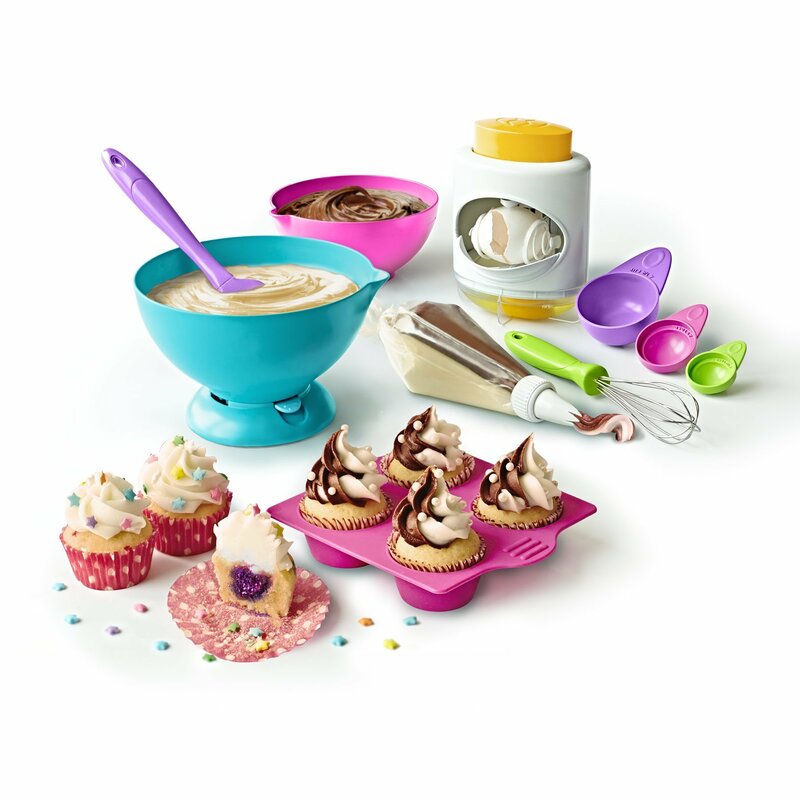 Each all-inclusive kit contains kid-friendly, real-working kitchen tools that makebaking easier, tidier & fun. To create Real Cooking delights, just add naturalingredients to the baking mixes (made in the USA) & pop them in the kitchenoven. Kids can create each unique treat with the included toppings & edibledecorations. The Real Cooking family includes the Chocolate Pen 2 & refills;Chocolate Pen Sweet Beats Treat Kit; Ultimate Baking Set; Deluxe Cookie BakingSet; Chocolatey Cake Pops Baking Set; Supreme Baking Set; Sprinkled MiniDonuts Baking Set; Real Cooking Refill 3 Pack - Tuxedo Cupcakes, SprinkleSurprise Cupcakes, & Mini Donuts & Cake Pop; & Real Cooking Refill 3 Pack -Glass Rainbow Cookies, Stacked Cookies, & Pink Sandwich Cookies. SkyrocketToys is a leading designer, manufacturer & marketer of a wide variety ofconsumer products, including toys, drones, bicycle accessories & sportinggoods. With offices in Los Angeles, Hong Kong & China, the company creates &distributes innovative, technology-driven products that are sold under majorlicenses, as well as propriety brands such as Fuse, Real Cooking, Prank Starand Sky Viper.